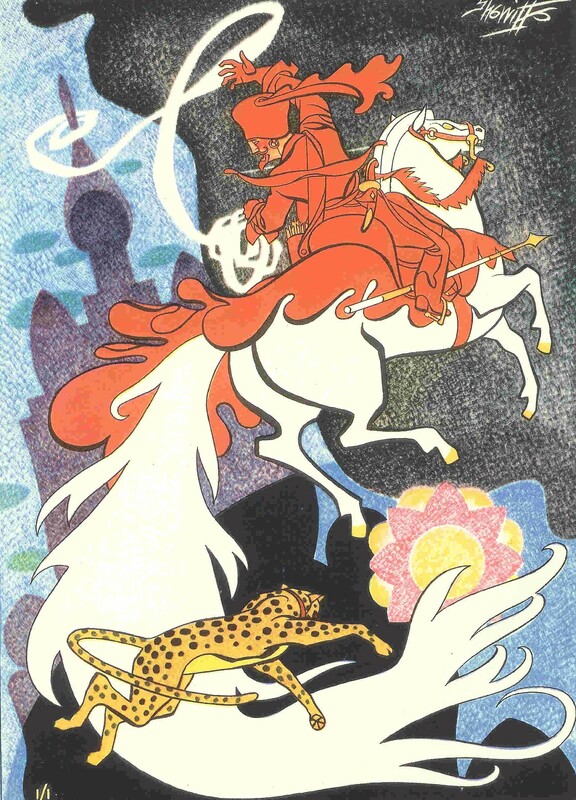 Background – Why create a blog about the Rubaiyat? Yet more on the puzzle about quatrain one – what does the ‘Stone’ signify? Back in October 2012, on this blog, Bob Forrest posed a question about the meaning and sources of the note to quatrain 1 of FitzGerald’s first edition, which suggests that “Flinging a Stone into the Cup was the Signal for ‘To Horse!’ in the Desert.”. There were several responses to the post at the time, and, since then, an informal research group of Bob Forrest (using the John Rylands Library in Manchester), Garry Garrard (in the London Library), and ourselves (in the Cambridge University Library), have been following up various leads on the topic. We posted an update on the subject in December 2012. Here is a further report on the quest, which has led us into rather murky waters, and severely tested our combined linguistic skills. Links to the two early posts are shown at the end of this note. First, there needs to be a correction to the December post, specifically to item 4 which refers to ‘a publication by Iohannes Augustus Vullers in 1833, entitled Chrestomathia Schahnamiana’. This reference was incorrect. That title exists, but the volume we consulted was actually Vullers’ Lexicon Persico-Latinum which was published in two volumes in 1855 and 1864 respectively. The information regarding the meaning of the word mohreh, which is as described in the earlier post, is contained in the second volume dated 1864. Vullers’ Lexicon refers to ‘throwing a stone into a cup as a signal for action’ as being an ancient Persian custom. Among the sources he references is Borhani qatiu which we have identified in the following printed version: Boorhani Qatiu, A Dictionary of the Persian Language explained in Persian … with an appendix … and Persian Notes, edited by Thomas Roebuck, Calcutta, at the Hindoostanee Press, 1818. The entry for mohreh in this volume contains the Persian phrase ‘throwing a stone into a cup’ but the explanation for it (as far as we have deciphered it so far) describes the custom as being that ‘when the emperor travelled, a stone was thrown in a resonant metal cup on the back of an elephant, and the loud noise gave a signal of departure’. This explanation ties up with the similar mention of an elephant in E B Cowell’s annotation in his copy of Richardson’s Dictionary (see point 3 in the earlier post). But we have not so far found any mention that clarifies Johnson’s reference to the stone in the cup as ‘a signal for mounting on horseback’ which is probably the source of FitzGerald’s use of the phrase ‘To Horse’ in his note to Quatrain 1 in the first edition. Well done all! What splendid detective work. So very glad to have the opportunity to read your findings even though, as you say, they’re not conclusive. But you’ve surely established the lineage of Fitz’s use of the image. Thank you. Many thanks for your kind comments, David. Wait for the next exciting instalment. We are now on the trail of ‘singing bowls’! An interview with Omar Khayyam appearing in my recent book Rose Bay Rubaiyyat has been published in Omariana. Now, in response to questions concerning FitzGerald’s first stanza: Awake! for Morning in the Bowl of Night / Has flung the Stone that puts the Stars to Flight, I made further contact with himself, entering a short question and answer dialogue; he doesn’t give extended interviews. Which scattered objects in the firmament. Of such inherent mass and magnitude. And justify your guided missile’s course? Would scrutinize and ponderously dwell. That one day would confound a cyber page. That motivates or justifies my ends. A fair comment from the Master. Thank you, Len.